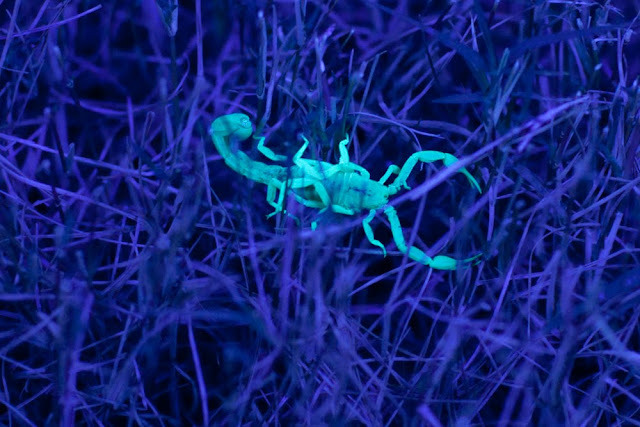 Did you know that scorpions glow under black light? This was something we were told when we moved here, and my husband decided to try it out for himself last night. He took a desk lamp fitted with a black light out into the backyard (he needed a looong extension cord) and came across this guy in the grass (because this is the desert and of course you'll come up with a scorpion in your backyard if you're really looking - eek!). 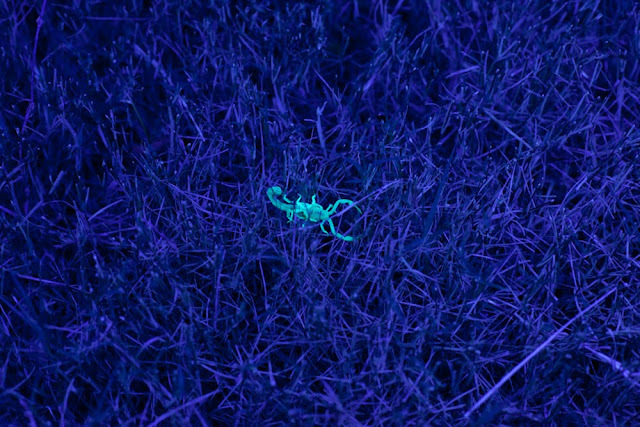 The photo is completely undoctored - the grass is glowing blue from the black light and the scorpion was fluorescing green! I think it's definitely Halloween appropriate! As is this close-up! Spooky! nOW thAT is just TOO cReEpy! Wow, that is pretty awesome! I did not know that lol.